Here you have it, the fifth Cursed Empire Dark Fantasy Roleplying Game Supplement. Enter the mystical and dangerous realm of the renegade cults of old or align with the new order of Elemental Cults as dictated by the High Priests. This supplement lifts the veil of secrecy from the mysterious societies of the Old Cults and explains how they interact and where they see their role in a world torn apart by manipulating religious fanatics. New Subclasses have been provided such as the Battle Siphon, Guide Emissary and Hand or "Claw". There are forty new spells to equip Warrior-Priest characters with some brutally effective new powers. Twenty-one Renegade Cults have been described and an interaction chart explains their relation to one another. A new optional rule relating to Religious Fervour (RF) is also outline, giving players and MT's a benchmark in order to situate characters' dedication to their cult. 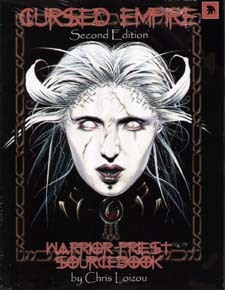 As with all Cursed Empire game books, the Warrior-Priest Class Module provides additional material for players and Masters of Tales alike as well as bonus material beyond the scope of the class itself for other players. A selection of renowned temples has been provided to enrich the game setting including some digital landscapes ready to be used as campaign or single scenario aids.